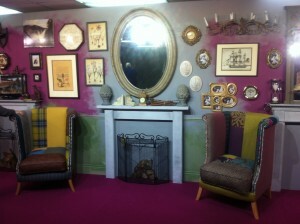 A little taster from Interiors 2012 and what's coming up! Last week I headed off to Interiors 2012 – a large trade show held in Birmingham every year. There are tons of suppliers there, all showcasing their new products and current ranges, so it’s always good to see what will be filtering through in to the retailers and magazines later on this year, and what lovely products I can use in my designs too! We’re talking classic design, but brought right up to date. Sofas shapes are looking back to the 1950’s and even earlier to inject some real glamour and form back into our upholstery. They’re far cosier than the early designs though. 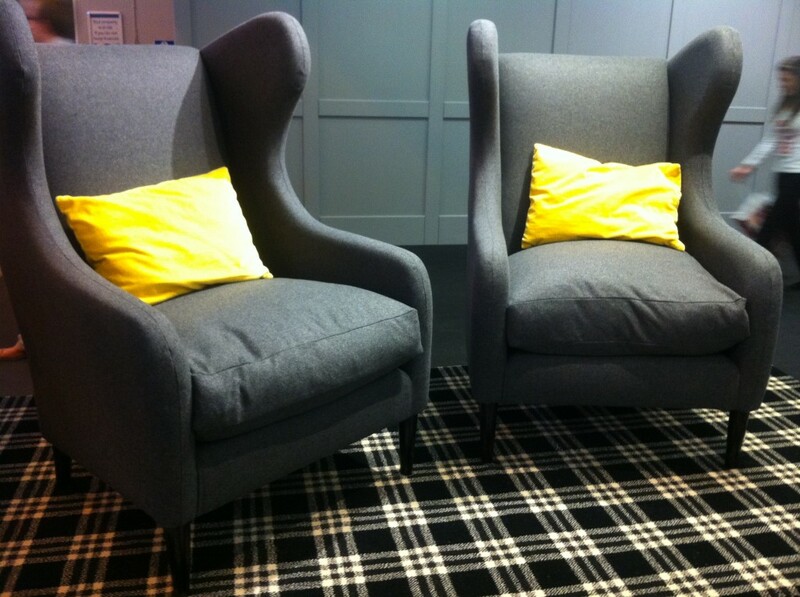 These chairs show exactly how this trend works – with a traditional wing chair design covered in charcoal wool and lifted with the mustard silk cushion. This year, bright and colours are going to be hitting our homes with a bang! Different colour palettes lend themselves to a number of styles – from more muddy colours for the retro schemes, tropical colours for modern, clean spaces, and strong, period colours adding depth to traditional interiors. Used in various different ways, they enable you to stay on trend and on budget. 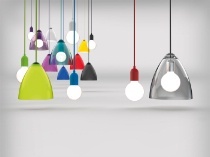 I have to say, these modern, bright lights really stood out for me – perfect for family spaces! Less is definitely more in this trend, and it’s about keeping it quite minimal, but ensuring the detail speaks volumes throughout the scheme. Sofas with contrasting trims are going to be very big, following on from how we’ve seen a rise in popularity of contrasting buttons on various upholstery items. Using patchwork is still a lovely way to make your interior unique – as seen on one of the entrance displays on the way in to the arenas – this display was great at showcasing a real vintage theme, set off with these fab chairs. But be careful here as it has to be used in the right way – too much detail and it all merges in to one. Choose your pieces carefully to ensure you get the right impact with them. What’s ticking all the boxes? 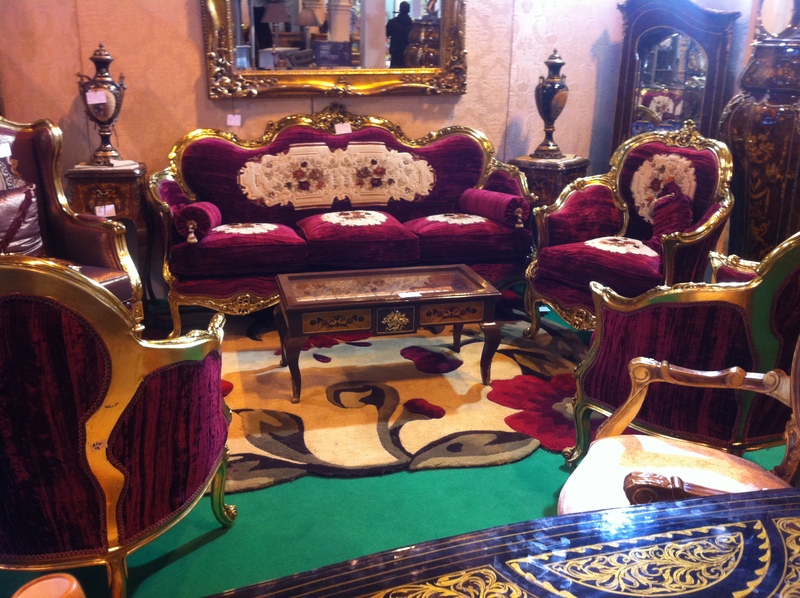 Well, for one example, this fantastic new range of occasional furniture. It would work in so many homes and you don’t have to be a fan of the 1950’s to love it. Just the bookcase alone in a dining room or hallway would create a fab focal point – plus it literally hits every one of the trends above!